Central United Methodist Church began in 1797 in a small blacksmith shop on the corner of East Beverley and North Coalter Streets. Sampson Eagon, a blacksmith and wagonmaker, gath ered a group of Methodist converts to his home and because so many people came to hear his message, the group had to meet in his blacksmith shop next to his home. And because of Sampson Eagon’s prayer and song services, the neighborhood became known as Gospel Hill. That area of Staunton is still known by that name. 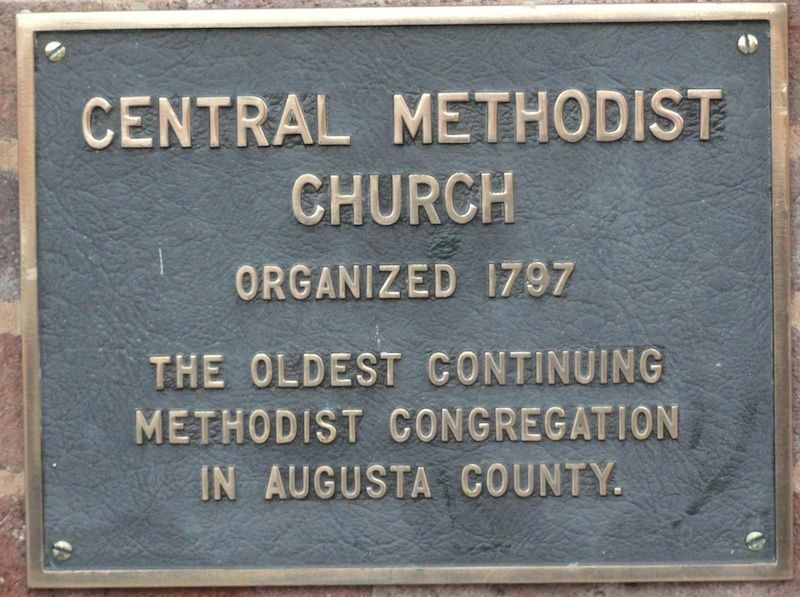 Around 1800, because neither Sampson Eagon’s home or blacksmith shop could accommodate the growing number of Methodists, land was purchased and the first church, a one story brick building, was constructed at the present Lewis Street location of Central United Methodist Church. The present church is the fourth one to be built in that location. The second church building, erected around 1830, was too small for the growing congregation, so a third church was built in 1859, but after the roof collapsed during a heavy snowfall in March 1892, it was necessary to build the fourth church. The cornerstone for the present church was laid September 3, 1892. During the construction of the new church, services were held in the Y.M.C.A. building located on the corner of Beverley Street and Central Avenue, now known as the Town Clock Building. The first pastor was the Rev. Noah Fidler who was commissioned in 1806, the official year of organized Methodism in Staunton. A church bell was purchased in April 1864. 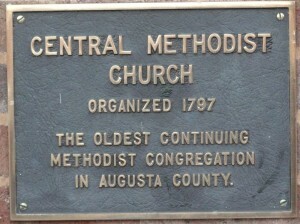 Originally known as the Methodist Episcopal Church, South, it was named “Central” on February 13, 1905. However, the name was not officially used as far as old records show until June 15, 1914. Another Methodist church was organized in Staunton in 1908 when the First Methodist Episcopal Church began holding services in the Bodley Auditorium (later occupied by Dunsmore Business College) on West Beverley Street. The new church, known as the Beverley Street Methodist Church, was first occupied in 1914, but was closed in 1973 when the church moved to Churchville Avenue and became known as Christ United Methodist Church. Still another Methodist church was formed in the Staunton community when St. John’s Church was established in 1954 in the northern section of the city. In the early sixties the decision was made by Central Church to construct an education building on the old Matthews property at the corner of Beverley and Lewis Streets. This building was consecrated February 28, 1965. In 1969 Central Church purchased the Gilpin Willson property which adjoins the church on the north side. The purchase of this property completed the full block of church ownership, extending from the corner of Lewis and Beverley Streets to West Frederick Street. The property was leased to the City of Staunton for municipal parking for five years but now is used strictly as a parking lot for Central. 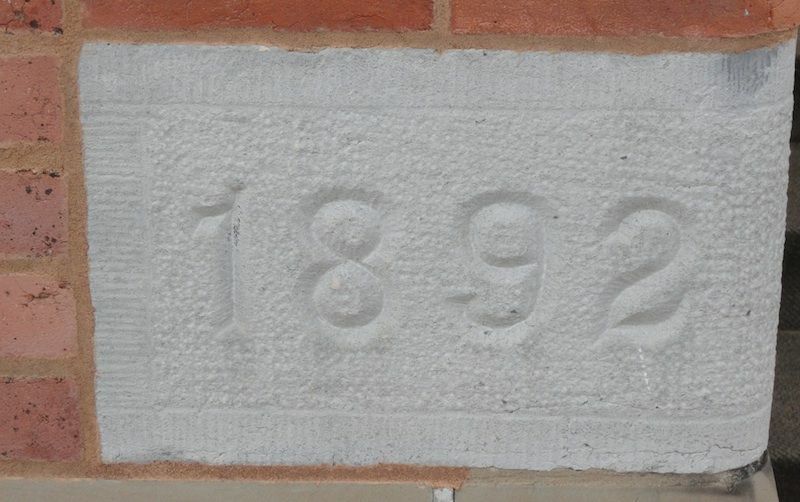 After Central celebrated its 200th anniversary in 1997, various improvements were made to the church property. Those additions included a reception area, an additional classroom, and library, addition of a four-floor elevator at the west end of the Education Building; and improvements to the basement of the Education Building. In 2012 the sanctuary was subject of a facelift involving refinishing and relocating the pews with additional seating space, new carpeting, painting, and an upgrade to the balcony area. “Two hundred years and the flame still burns” is the theme for Central’s bicentennial and the flame from Sampson Eagon’s blacksmith shop is still being felt as Staunton/Augusta County Methodists join members of Central Church as they observe their church’s historical beginnings.